When Julia really needed support as she was diagnosed with breast cancer, he didn’t go to the doctor appointments with her. When her cousin passed away unexpectedly, he didn’t go to the funeral, nor did he comfort her as she grieved. She felt like she had become irrelevant and invisible to her husband. She shared with me how he didn’t appear to be particularly interested in connecting with her, knowing her hopes and dreams, understanding her worries and fears, or having any level of intimacy with her. They didn’t talk, they barely touch and he has stopped giving her a kiss goodbye in the morning on his way out the door. This isn’t the kind of marriage she envisioned for herself. This isn’t the kind of marriage she thought she and her husband would create. But unfortunately, Do as I say, but not as I do, doesn’t work very well. Julia simply didn’t realize what she was teaching her daughter through her actions….or her inactions. 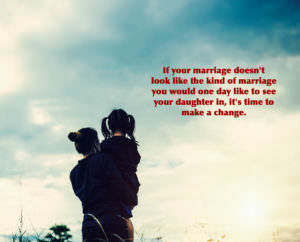 Through our living example, we teach our children what love and marriage looks like. So, what are we teaching them right now? …But It’s Okay for You? Julia’s answer was a sobering realization for her. There was no one on this planet that she loved more than her daughter, so of course she would never want to see her daughter in this kind of marriage, disregarded by the one that promised to love and cherish her. And yet, she was willing to accept it for herself. She wondered why she wasn’t showing herself the same regard, the same love, the same high standards she hoped her daughter would do for herself one day, even though, much like herself, she’s never been taught how. We want to give our children everything we possibly can. We save for their education. We buy them the latest iPhones and the coolest shoes. But what our children want and deserve, more than anything, is to have happy parents and live in a happy home. And he deserves that, doesn’t he?